Call us for better pricing! Are you struggling to find the perfect combination of flash storage and predictive analytics? HPE Nimble Storage All Flash Arrays combine a flash-efficient architecture with HPE InfoSight predictive analytics to achieve fast, reliable access to data and 99.9999% guaranteed availability.1 Radically simple to deploy and use, the arrays are cloud-ready, providing data mobility to the cloud through HPE Cloud Volumes. Your storage investment made today can support you well into the future, thanks to our technology and business-model innovations. 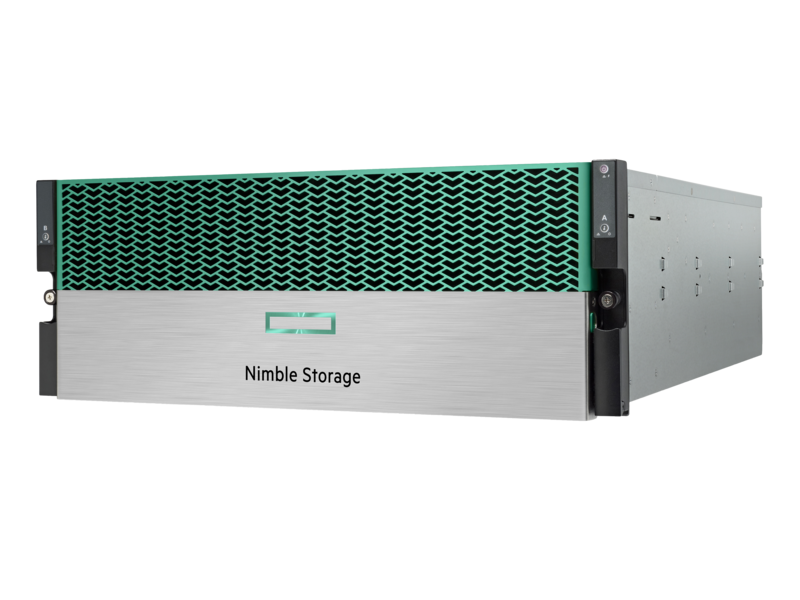 HPE Nimble Storage All Flash Arrays include all-inclusive licensing, easy upgrades, and flexible payment options – while also being future-proofed for new technologies, such as NVMe and Storage Class Memory (SCM). Performance is up to 65% faster and twice the scalability of previous HPE Nimble Storage All Flash Arrays. HPE Store More Guarantee delivers more effective capacity per terabyte of raw flash than competitive all-flash arrays. Future-proofed for NVMe and SCM based on our timeless storage. HPE Nimble Storage All Flash Arrays automatically predict and resolve 86% of problems before you even know there is an issue. Transforms the support experience through cloud-based predictive analytics and Level 3-only support. Holistic view across the infrastructure stack to resolve problems beyond just storage. 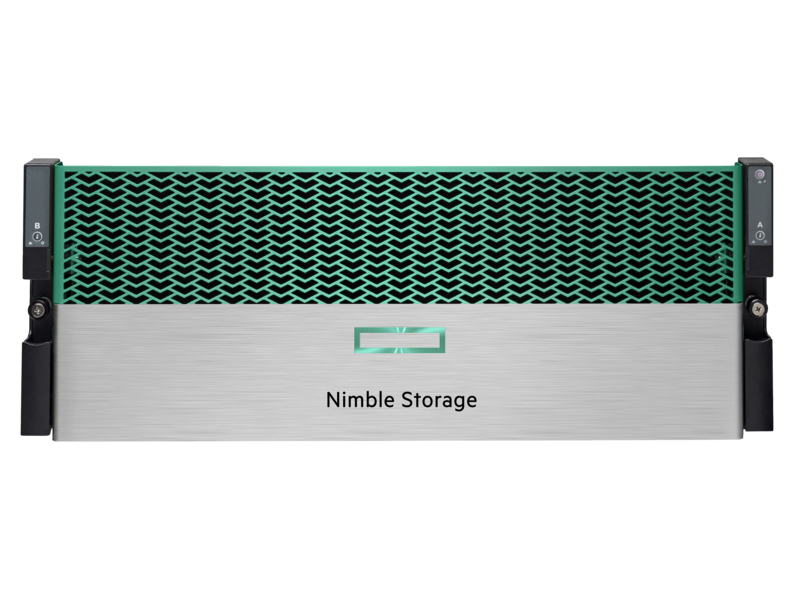 HPE Nimble Storage All Flash Arrays are simple to deploy use, and manage. HPE Nimble Storage All Flash Arrays are future-proofed for NVMe and SCM. The offering comes with a satisfaction guarantee, all-inclusive software licensing, flat support pricing, replacing all the hardware for upgrades, and an option to receive a free faster controller upgrade after three years. HPE Nimble Storage All Flash Arrays has 99.9999% guaranteed availability. Triple+ Parity RAID can handle three simultaneous drive failures and provides additional protection through intra-drive parity. App-granular, FIPS-certified encryption provides data-at-rest and over-the-wire protection, data shredding is built-in. Native application-consistent snapshots and replication, as well as integration with leading backup software. 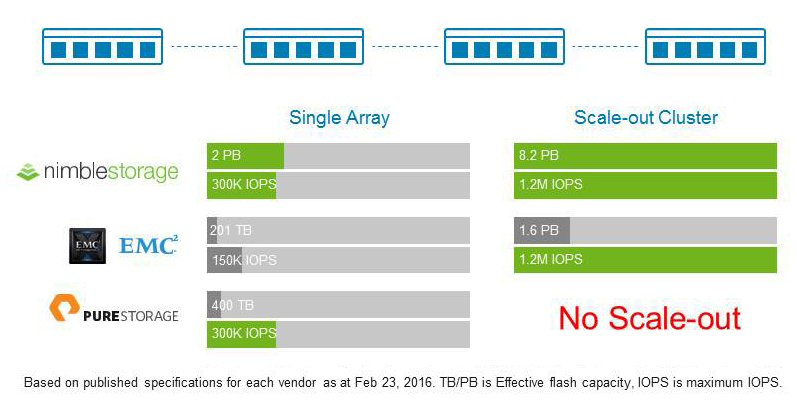 HPE Nimble Storage All Flash Arrays are scale-to-fit. They scale-up performance and capacity independently and non-disruptively; and scale out to four arrays managed as one for increased flexibility. Up to 5X or more data reduction from variable block inline deduplication and compression. Backup and disaster recovery (DR) from all-flash to adaptive flash arrays at onethird the cost. Data reduction, snapshots, and Triple+ Parity RAID with no performance impact. Sustain 1.2M+ IOPS with consistent sub-ms response time and never worry about performance again. Scale-up seamlessly to grow the performance and capacity of an array. Scale-out non-disruptively to over 8PB in a cluster that's managed as one. Integrated and certified with industry-leading applications to streamline deployment and simplify management. No need for manual application performance tuning. Auto QoS prevents noisy neighbor issues. QoS Limits allow you to set explicit IOPS and/or bandwidth limits. Nimble arrays are Cloud Ready, giving you the flexibility to create a multicloud environment. Easily migrate data between on-premise flash arrays and the public cloud with Nimble Cloud Volumes. Delivers 20% more usable flash capacity through a highly efficient logging filesystem that is combined with advanced flash endurance management. Advanced Flash Endurance Management extends flash lifespan and requires less overhead, driving down cost and data center footprint. 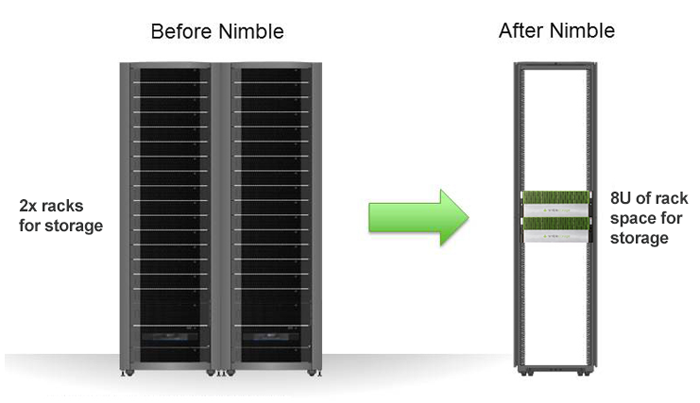 With Nimble, less is more. Buy up to 80% less storage for the same amount of data. That's the miracle of Nimble variable-block deduplication and compression. Place primary workloads on All-Flash, and use Adaptive Flash arrays for backup, DR, Dev/Test and archival at a third of the cost of All Flash. InfoSight eliminates the stress of dealing with infrastructure. It uses cloud-based predictive analytics and machine learning to anticipate and prevent problems before your business is impacted. No need to worry about infrastructure anymore – InfoSight takes care of it for you. Nimble arrays come with a satisfaction guarantee, all-inclusive software licensing, flat support pricing, no forklift upgrades, and an option to receive a free faster controller upgrade after three years. All Flash arrays are future-proofed for newer technologies. Using flash for backup, DR and archival can sometimes be cost-prohibitive. That's why Nimble also allows its cost-optimized Adaptive Flash arrays to be used for backup, DR, Dev/Test and archival at a third of the cost of All Flash. And since both primary and secondary arrays share common data services, you'll get identical functionality and user experience. Non-stop availability delivers 99.9999% measured availability through predictive analytics and ‘no single point of failure’ hardware and software design. Tolerate 3 simultaneous drive failures plus additional protection from intra-drive parity and integrated sparing. This takes RAID protection to a level never seen before in All Flash arrays. Application-granular, FIPS-certified encryption and secure data shredding provides end-to-end security for data at rest and on-the-wire when replicated offsite. Storage is pre-configured and optimized for applications out-of-the-box. Tasks such as selecting RAID-level, media layout, aggregations and reserves are not required. Initial setup and configuration can be completed within two hours. HPE Nimble Storage solutions are built on its patented Cache Accelerated Sequential Layout (CASL) architecture. CASL leverages the unique properties of flash and disk to deliver high performance and capacity – all within a dramatically small footprint.CASL and InfoSight form the foundation of the Adaptive Flash platform, which allows for the dynamic and intelligent deployment of storage resources to meet the growing demands of business-critical applications. CASL and InfoSight form the foundation of the Adaptive Flash platform, which allows for the dynamic and intelligent deployment of storage resources to meet the growing demands of business-critical applications. Flexibly scale flash to satisfy the changing performance demands of today's business-critical applications. Tailor the amount of flash allocated to workloads on a per-volume basis. Assign one of three flash service levels (All Flash, Auto Flash and No Flash) to accommodate latency-sensitive critical applications to capacity-optimized applications, for management efficiency and optimal TCO. CASL caches "hot" active data onto SSD in real time—without the need to set complex policies. This way it can instantly respond to read requests—as much as 10X faster than traditional bolt-on or tiered approach to flash. CASL collects or coalesces random writes, compresses them, and writes them sequentially to disks. This results in write operations that are as much as 100x faster than traditional disk-based storage. CASL compresses data as it is written to the array with no performance impact. It takes advantage of efficient variable block compression and multicore processors. A recent measurement of our installed base shows average compression rates from 30 to 75 percent for a variety of workloads. CASL allows for the non-disruptive and independent scaling of performance and capacity. This is accomplished by either upgrading the storage controller (compute) for higher throughput, moving to larger flash SSD (cache) to accommodate more active data, or by adding storage shelves to boost capacity. This flexible scaling eliminates the need for disruptive forklift upgrades. Scale capacity and performance beyond the physical limitations of a single array by seamlessly clustering any combination of HPE Nimble Storage hybrid arrays. Eliminate capacity silos and performance hotspots, and easily manage all hardware resources across the cluster as a single storage entity. CASL can take thousands of point-in-time instant snapshots of volumes by creating a copy of the volumes’ indices. Any updates to existing data or new data written to a volume are redirected to free space (optimized by CASL’s unique data layout). This means there is no performance impact due to snapshots and snapshots take little incremental space as only changes are maintained. This also simplifies restoring snapshots, as no data needs to be copied. HPE Nimble Storage efficiently replicates data to another array by transferring compressed, block-level changes only. These remote copies can be made active if the primary array becomes unavailable. This makes deploying disaster data recovery easy and affordable – especially over a WAN to a remote array where bandwidth is limited. HPE Nimble Storage arrays can create snapshot-based read/writeable clones of existing volumes instantly. These clones benefit from fast read and write performance, making them ideal for demanding applications such as VDI or test/development. With HPE Nimble Storage's Adaptive Flash platform, it is easy to accommodate application growth by scaling performance, capacity, or both—efficiently and non-disruptively. While the CASL architecture enables seamless, independent scaling, InfoSight's powerful deep-data analytics deliver precise guidance on the optimal scaling approach to fit the requiremets of critical applications. HPE Nimble Storage's Adaptive Flash platform features a scale-out architecture that makes it easy to scale capacity and performance beyond the physical limitations of a single array. 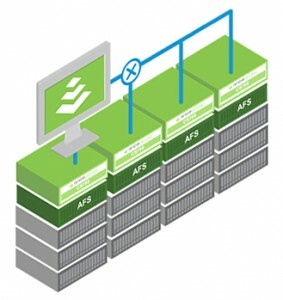 Any combination of HPE Nimble Storage CS-Series arrays can be seamlessly configured into a storage cluster that accomodates growing business-critical workloads and supports new ones, without complicating storage management by creating additional silos or breaking the budget with forklift upgrades. 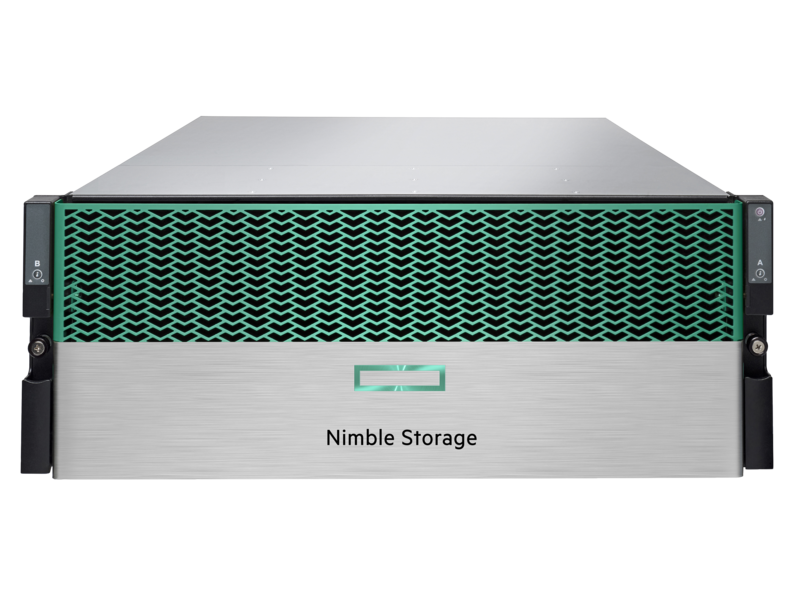 HPE Nimble Storage's innovative approach to scale-out storage dramatically simplifies configuration, upgrades, and management. Host interface Each array controller has 2 x 10GbE ports built in. Optional ports are 1GbaseT, 10GbaseT, or 10GbE SFP+, or 8/16G Fibre Channel. Availability features Triple+ Parity RAID for data protection (triple drive and intra-drive parity), 99.9999% guaranteed availability, redundant hardware/software design, no single points of failure. 1-year, parts-only warranty for hardware components and 90-day, software updates for defects. Additionally, Hewlett Packard Enterprise provides phone support for replacing a defective part. Additional support coverage is required for HPE Nimble Storage All Flash Arrays. Note: For hardware warranty claims, defective part must be received before replacement parts are shipped. Download HPE Nimble Storage All-Flash Array Datasheet (PDF). Download HPE Nimble Storage Product Brief Datasheet (PDF). Download HPE Nimble Storage Technology & Features Primer Datasheet (PDF). Download White Paper: Redefining Flash Storage (PDF). Download White Paper: Scale-to-Fit Storage (PDF).